Writing is quite solitary. Even though I am part of a writing community– and have so much support and collaboration with dear friends– in the end, I have to do the work alone. I can’t explain just how alone I have felt over the last month or so, especially being single. Theoretically, I understand that even if I were dating or married, I would still have to do the hard work of revisions on my own, but … I’ve felt a little untethered and singular. Very, very much solo in this treacherous territory. Harder than I ever imagined. I’m not referring only to the actual act of writing here … but to the head game. I get to a point where I start to hate my manuscript … my beloved story that I’ve poured my soul, energy, and tears into. Do you know how crippling that is– how it folds your spirit into such ugly shapes that you worry you’ll never sort yourself out again? I’m back in therapy, folks. Things got pretty dark– to the point where I started questioning my identity as a writer, ultimately asking myself, Is this really what I want? There, in the darkness, I saw a pinprick of light: the certainty that my answer was yes. My lovely new therapist asked me to picture the Holy Spirit sitting beside me, looking at our manuscript, saying, Look what we’ve made. It made me bawl. Of course. I so desperately want to honor God with my fiction. The thought of him looking on my manuscript with pride was such a reminder to me that no matter how lonely this road seems, I have a faithful companion. 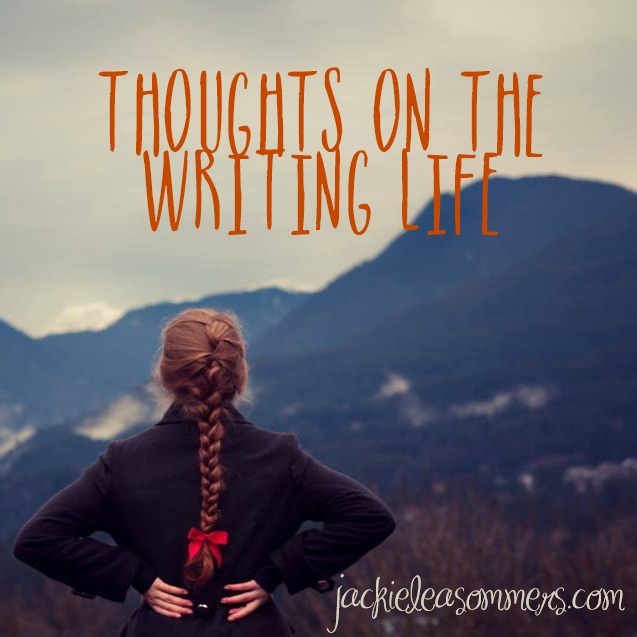 This entry was posted in creativity, ranting, real life, romance, writing, YA and tagged eternally single, God is with me, jackie lea sommers Christian writer, ranting about being single, single writer, thoughts on the writing life, writing is hard, writing is lonely, writing is solitary, writing is worth it by Jackie Lea Sommers. Bookmark the permalink. Sounds like you have a great therapist. Writing can be lonely and so draining and emotionally pommeling. I’ve had the feeling of hating my manuscript too. I just got my ms back from the beta reader and I have a lot more work to do on it than I thought. It’s disheartening. Yes– SO hard, so frustrating!! Hang in there!